If you are looking to buy online Aakash tablet(Ubislate 7) in India at student discount price then it is available at Rs 1700. Many websites offer online buy and booking of Aakash tablets in India. No website is giving details of buying tablet at student discount price. The questions like “how to get Aakash tablet online at student discount price?” are yet to be answered. Read this article to know how to buy online Aakash Ubislate 7 tablet at student discount price. Before I tell you how to get Aakash Ubislate 7 at student discount price of Rs 1700?, you should know features, specifications of Aakash Ubislate 7 tablet in India. I know, it is world's cheapest tablet and thinking of Rs 1700 for a tablet it great deal to get but still think before making purchase because this tablet is for those poor students who cannot afford to have expensive laptops. Some IIT professionals who got this tablet during its early manufacturing phase claimed that its touch hangs in between, tablet becomes over heated within 1 hour or so, battery backup is not so good but still come to positive phase i.e. its cheapest price. 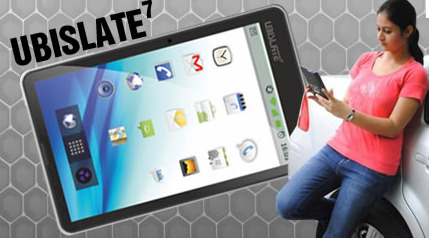 It is difficult to think that how large price gap take place between Aakash and other tablets such that Samsung, Apple, Motorola and Sony tablets are available in market at price in range of Rs 30,000 – 40,000, If you compare Aakash Ubislate 7 tablet with them then consider that you are getting tablet at very low cost which is great deal to purchase. If you are not a student and still looking for Aakash UbiSlate tablet in India then its price for you is Rs 3000. Never to forget that Aakash tablets are yet to deliver to distributors. So, it is selling at prices more than its original price. Many websites offering online Aakash Ubislate 7 tablet purchase and showing links of pre-booking. It is difficult for customers to know their actual price. So, I want to clear my point once again. It will for students and therefore price for students is Rs 1700 and if you are not a student then you will get at price of Rs 3000 or more than it. How to buy Aakash Ubislate 7 tablet at student discount price? If you are not a student then you will get the Aakash tablet from many online websites but "how will students get tablets at discount price of Rs 1700? ", as far as I know, It is Government of India which has not cleared its point while selling tablets in India. Human resource development announced cheap Android tablet in India and argued that it will be distributed to many universities and colleges but not specified list of colleges and universities names publically?, many students of Delhi University and IIT Delhi are already got Aakash tablets. If we see online forums then every forum based website is full of questions like "how to buy Aakash tablet at student discount price online?" But no one is there to answer those questions. Who will answer all those questions? Till yet no website has explained online buying procedure of Aakash tablets at student discount price. Websites only have booking page which has many pending requests and no one there to inform students about their pre-booking status. The Aakash tablet Toll free number is busy all the time. All websites are looking of making some black money out of Aakash tablets. Websites are giving toll free number but how many of you are getting connected with single given number? Only lucky students are connected with toll free number (1700 180 2180). Still out of them, no student is convinced from their response, Aakash customer care has one word to say "connect and talk to your college or university authority", they will going to answer your query and then talk to us. If students want to check list of Universities and colleges which are getting Aakash tablets then it is not mentioned on Internet. So, it is better to talk with your college or university management and ask them what they have done for getting cheap Aakash tablet for students?, It is strange to see that it is for students and still no one is there to solve student doubts about Aakash tablets. Till then, keep on calling the Aakash tablet toll free number. Hoping that someone from Human resource ministry will come and clear students doubt regarding Aakash tablet discount price and other buying procedure details. Akash Ubislate 7 is known to be the world's cheapest tablet available so far in the market. Aakash is creating a new revolution in the tablet market. We are providing you the link to book your Aakash tablet online and to make all queries related to the tablet. Read the below article to get more details. Aakash 2 Ubislate 7 tablet features and configuration are going through many updations. It is Human resource minister, kapil sibal who responded that Aakash 2 tablet features and configuration got modified. Aakash 2 tablet online booking and buying will be started from February or March 2012. Read this article to know more about Aakash 2 Ubislate 7 tablet features and its improved configuration. Aakash 2 Ubislate 7 online prebooking and Aakash Ubislate 7 online sales are started on www.aakashdatawind.com. You can buy Aakash tablet online and also prebook Aakash 2 Ubislate 7 tablet at price of Rs 2500 and Rs 2999. You can purchase Aakash tablet online by clicking on page link given below. Read this article to know about how to buy Aakash tablet online in India. Moreover, you can also know online pre booking procedure for Aakash 2 Ubislate 7 tablet. The official website of Aakash Tablet or Ubislate 7 is now active and you can pre-book Ubislate 7 online through aakashtablet.com. Ubislate 7 is the updated version of Aakash Tablet. Pre-book now and get the world cheapest tablet Aakash on your finger tip. Difference between Aakash Tablet and Ubislate 7 with Specifications, price in India and features of Ubislate 7 are also included here. This is an article which gives you the comparison between the Aakash tablet and the Ubislate 7 which are the world's cheapest tablet. Many people are now confused on which one o buy in this. As off now only the Aakash tablet which is for students is now for sale and the Ubislate 7 is expected to be released by the end of January 2012. Here by I would have compared all the features between these two tablets and make you clear on which tablet to buy for your use. Plz send aakash tab at my place, address i am a student of ihm shri shakti college, my address:- honry captain surendra rawat, janki sadan, amand nagar, balawala , dehradun, uttrakhand. My name is : SAQUIB ANWAR. its very helpfull for all the students who can't buy the expensive laptops,pc,e,t,c. Aakash tablet booking and buy at student discount price can only take place through College and university in which you are studying. If you are willing to purchase this irrespective of its price then go to www.aakashdatawind.com and book AakashUbislate 7+ tablet(Aakash 2 tablet). Aakash tablet student price will have some time constraints and it is expected that Datawind will produce 70,000 more Aakash tablets units in April 2012. so, wait for April 2012 so to get Aakash tablet at student discount price. Sometimes ago I have booked Akash tablet for my sons, who are studying. I received code no. but later I was told to send cheque in advance. While I was making up my mind to do so, news came that govt. of India and Datawind are no more in contact to deliver Akash tablets. What is the truth I am unable to know. Will you pleas? I'am student of Visva Bharaty university at Santiniketan. Please, send me one Aakash Tablet to me. How to buy Aakash 2 tablet for students in India. Please let me know. Can I order it online? Or, can I buy it from some shops like Chroma in India? I am a student and i need this tab . Hi I am a student. I need this tablet PC. My phone number is 7298626105. I am from Kashmir. Please tell me how to buy Aakash tablet. I am a student so I want to buy this tablet. Please send me a Aakash Tablet. I'm a student.